Despite reduction in credit card transaction fee, what credit card companies made in net income in 2018 was 12.3% higher than that in 2017. Amount of profits from credit cards in 2018 increased by more than $880 million (1 trillion KRW) compared to that of 2017 due to huge increase in fees paid by small franchise stores and profits from card loans. Despite side-effects from reduced credit card transaction fee paid by small franchise stores, amount of profits that they made from franchise stores increased by about $528 million (600 billion KRW). Financial Supervisory Service (FSS) explained that although total costs increased by $863 million (980 billion KRW) due to marketing cost ($528 million) and financing cost ($176 million (200 billion KRW)), their overall performance still increased as amount of total profits increased by $995 million (1.13 trillion KRW) due to profits from fees paid by franchise stores ($528 million) and profits from card loans ($352 million (400 billion KRW)). However, net income actually decreased based on accounting standards as amount of bad account costs increased when allowance funding standard was applied. Cost of loan loss provision in 2017 increased by $187 million (212.9 billion KRW). 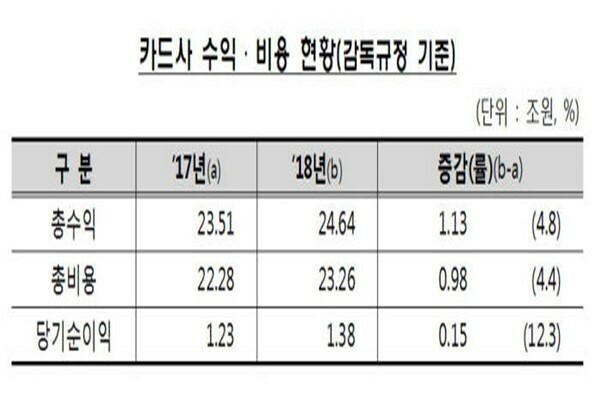 Actual net incomes of credit card companies excluding bad account costs decreased by 4.4% ($55.4 million (62.9 billion KRW)) compared to the previous year. When IFRS (International Financial Reporting Standards) are applied, some of credit card companies such as Shinhan Card saw reversal of provision of $393 million (446.1 billion KRW) and took in less net profit in 2018 than 2017 due to base effect. FSS explained that IFRS-based net incomes of credit card companies in 2018 were 7.4% less than that of 2017. “Based on IFRS, Shinhan Card’s net income actually decreased as temporary positive factors were eliminated.” said Director Lee Sang-min of FSS’ Loan Financial Supervisory Office. FSS analyzed that side-effects from reduced transaction fees would not be much in the future. It stated that side-effects would not have much impact as number of credit cards issued and amount of credit card usage are increasing. Number of credit cards that were issued in 2018 was 105,060,000 and it increased by 5.6% (5.6 million) compared to that of 2017 (99,460,000). Amount of credit card usage in 2018 was $733 million (832.6 trillion KRW) and it also increased by 5.6% ($39.2 million (44.5 trillion KRW)) compared to that of 2017 ($694 million (788.1 trillion KRW)).